In this debut graphic novel for children, a young plesiosaur must undertake a dangerous quest for the sake of her secret homeland. Deep beneath Loch Ness, a tunnel leads to a forgotten world: the Hidden Loch, “home to many aquatic creatures, several thought to be extinct or mythical.” Isolated from Earth’s other waters, the inhabitants rarely leave their idyllic realm, fearing the hostile humans, or “drywalkers.” The submerged society is led by the “paddle giants” (plesiosaurs); occasionally, the reigning matriarch will venture “into Loch Ness to gather important information about the outside world,” a process called “arcking.” Nessandra, granddaughter of the current matriarch, Granmama Saurus, can’t wait until it’s her turn to arck—but then tragedy strikes when a drywalker’s harpoon kills the beloved leader. Four years later, nervous about her first arck ceremony, Nessandra sneaks alone into Loch Ness, where a sinister submarine from the Institute of Cryptozoology snares her in a net. She’s shocked when a drywalker frees her, leaving loch elder Gran Beryx, who followed her, in the other humans’ clutches. In order to save Beryx and keep the Hidden Loch from discovery, Nessandra must embark on a perilous rescue mission. Luckily, she has company: her adopted mermaid sister, Allura; squid friend Krakey; and excitable electric eel Zapp. Can the four preserve their home? And are the drywalkers all evil? Maddux-White’s story may be a straightforward “journey to knowledge” tale, but it’s fast-paced and fun; yet the real star is the art. St. Aubin’s character design is delightful and expressive, full of undulating, floaty lines that reinforce the watery setting and sharp edges that bring the players into the foreground. The book’s panel layout varies from insets to two-page splashes but is always easy to follow. Garcia’s candy-colored palette echoes the brightness of a Saturday morning cartoon: vivid shades of blue and green infuse the underwater scenes with light and tranquility. 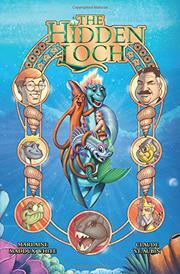 The loch creatures sport many hues, including purple, yellow, turquoise, orange, brown, and black (although the drywalker cast is mostly white). A brief glossary at the end provides useful information about the real-life marine animals represented: some long extinct, others “living fossils” like the coelacanth and lungfish. A charming illustrated adventure under the sea.